The light’s were on at Stormont on Wednesday night for Run in the Dark. Run Forest Run was in Drum Manor. 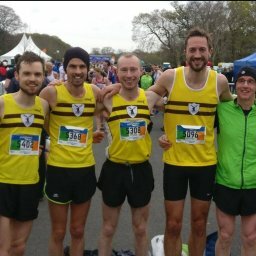 A Fast 5Km in Downpatrick & a very impressive British & Irish Masters XC medal haul as well as parkruns far and wide were the highlights of North Belfast Harriers running week. Wednesday evening saw over 2,000 turn out for the annual event ran within the Stormont Estate. Always well supported by the club, several Harriers took on the 5 and 10km routes. 5K 3rd Stephen Walker 18:57, Kelvin Kearney 19:58, Paddy McCambridge 23:04, Joanne McAllister 33:15. 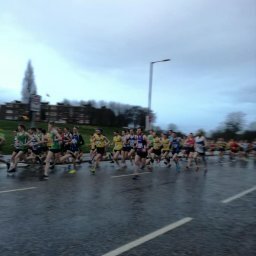 10K 5th Simon Reeve 39:12, Philip McIlwrath 53:42, Fiona Magill 55:14, Catherine Seawright 57:02, Mia McDowell 1:05:09, Claire Brady 1:07:08, Rosy Ryan 1:36:33. Saturday morning saw the Run Forest Run series take place in Drum Manor Forest Park just outside Cookstown. Catherine Seawright ran 58:13 in the 10k. Holly Bennett finished the 5k in 29:39. 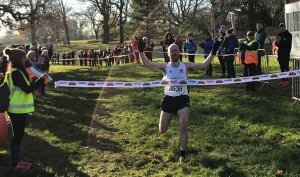 North Belfast Harriers’ Mark McKinstry was a star performer at the 31st annual British & Irish Masters International XC in Swansea on Saturday. Making his debut in major masters competition at the age of 35, having been runner-up in the Northern Ireland senior championships the last four years, he surprised his competitors with a very fast first lap and then held them at bay over the last three laps. Mark’s heroics also led his Northern Ireland M35 team to 3rd place in the team competition – the team included Allan Bogle, John Craig, Chris McGuinness, Stephen Nicholson, Pius McIntyre. 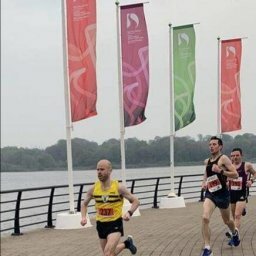 Neil Carty picked up a team silver medal in the M50 race, whilst David Clarke and James Wallace were all part of the Northern Ireland M55 team who also finished in 2nd place. In the M45 team competition, NBH’s Eamon White collected a team bronze medal. North Belfast Harriers were also represented in the women’s squad by Carol Clarke. In a fiercely fast and competitive 5k on Sunday, North Belfast Harrier John Black took the top podium place in 15:21. Connor Curran took 9th with 16:06 whilst John McGuigan 17:51 and John Patience 19:13 also posted respectable times. Over 50 Harriers ran at 13 different parkruns on Saturday morning.